Make a conscious decision to lead and move beyond your current role. Make the decision on your own. Take the risk and you'll thrive in your job and get that next promotion. Today I curated a Fast Company article entitled The Four Things People Can Still Do Better Than Computers for my Leaderly and Listable Scoop.It. The Fast Company article describes the changing labor market and those skills that will be valued in our changing world. Computers are not good at being human. Computers are not good at leadership. Choose leadership to stay relevant. I found the Fast Company article interesting and would recommend reading it. We need to stay relevant. Thanks for reading. 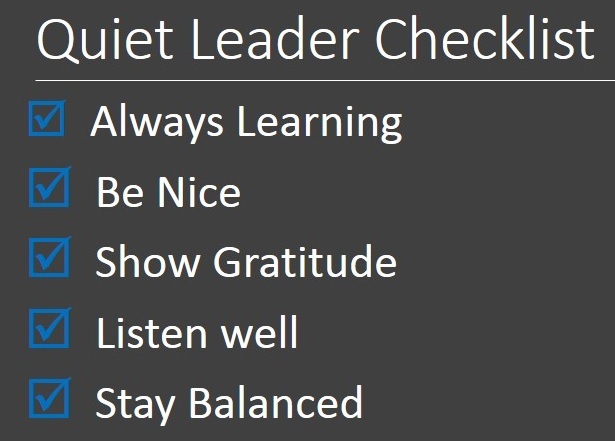 Choose leadership, quiet leadership. To-do lists, bucket lists, blog rolls, checklists, best seller lists, grocery lists, most emailed lists, Forbes richest people lists, reference lists, Fortune 100 Lists, dream list, David Letterman Top Ten Lists and more. I often get leadership inspiration and insight from a good list. To me, a list from a great thinker like Tom Peters, Seth Godin, Michael Hyatt, Gretchen Rubin will teach, coach, and inspire. And best of all, it may only require a short amount of time to find that one nugget that makes a difference. For the past few weeks, I have been curating and sharing leadership lists in an effort that I have titled, Leaderly & Listable. You can access these lists on this blog on the Leaderly & Listable page or directly on the Leaderly & Listable Scoop.It site. Finally, if you find a good list that you think should be included in this effort, Tweet a link using the hash tag #LdrLst (think Leader List with no vowels). I can include the list in this effort. A mini-MBA in leadership: @tom_peters: Tom's posted a leadership self-assessment at http://t.co/E85iX6cp46. If you are looking for a quick checklist for leaderly actions, the summary at the bottom of the post provides that mini-MBA in leadership. Meetings as leadership opportunity #1. Expert at holding productive conversations. Creating a culture of automatic helpfulness by all to all. Conscious master of body language. Avid practitioner of MBWA/Managing By Wandering Around. Avid student of the process of influencing others per se. Student of decision making and devastating impact of irrational aspects thereof. Brilliantly schooled student of negotiation. Creating a no-nonsense execution culture. Meticulous about employee development/100% of staff. Student of the power of "d"iversity (all flavors of difference). Aggressive in pursuing gender balance. Making team-building excellence everyone's daily priority. Understanding value of matchless 1st-line management. Instilling "business sense" in one and all. The list is a wealth of great reminders. The entire post is indeed a mini-MBA in leadership. I was impacted recently when one of my employees left my team to pursue opportunities outside of my company. That event and a review of my own career opportunities motivated me to study the role of growth and employee development in leadership. I had to face the reality that the team member left my team because I had failed to fully understand and act on the development needs of the departing team member. Leaders need to be people developers. You must help them grow or watch them go. The imperative this leadership role was validated for me with a review of the John Maxwell book, The 5 Levels of Leadership: Proven Steps to Maximize Your Potential. Maxwell’s levels provide a framework to measure and grow your leadership abilities. In this framework, all leaders start at the bottom (Level 1) and grow to higher levels of influence. Levels 2 – 4 represent a hierarchy of skills that you earn as a result of your relationships, problem solving and development. Few leaders reach the pinnacle (Level 5). Each level builds on the previous level and you progress to the next level after mastering and maintaining the previous level. The Maxwell book provide great insight but you can also get a sample of the framework directly from Maxwell from the YouTube embedded below. The Maxwell framework helped me pinpoint that I had personal development of my own in order to occupy a Level 4 position. Here is a quick list of the best behaviors and guidelines of Level 4 People Development leadership. 2. Positioning – Placing the Right People in the Right Position. A leader must understand the strengths and weaknesses of their team and put people in a position to succeed. I have previously written about this as the Tom Kelly approach in Lead like a Teacher - Find the Right Role. 3. Modeling – Showing Other How to Lead. It is simple. Model what you want to see in others. 4. Equipping – Helping Other Do Their Jobs Well. Leadership is not just delegation. It is delegation along with support, coaching, and mentoring. 5. Developing – Teaching Them to Do Life Well. Good life skills help a person create a a foundation for success. 6. Empowering – Enabling People to Succeed. As Maxwell write, “you need to trust them, believe in them, and hold them accountable. 7. Measuring – Evaluating Those Whom you Develop to Maximize their Efforts. This is a simple behavior that proposes that you evaluate and keep score in order to learn and grow. I discovered many new leadership insight in the Maxwell book. I would recommend quiet leaders explore this insight. Thanks for reading. Please lead quietly as people developers. I had the pleasure of seeing the movie Lincoln this past week and came away appreciating the performance and tone of the movie. I think there is a tendency to view Lincoln as the ultimate hero. Maybe it is a notion set by our history text books or even older movies. I’m not saying that he isn’t heroic. I’m really suggesting that his persona is too complex to be conveyed in a single label like “hero.” I think that the movie was true to this complexity. his ability to bring his political rivals into his cabinet and sooth their egos, turn these rivals into allies, and gain their respect and loyalty through his political skill and insight into human behavior. It is this skill that the quiet leader in us emulates and the basis for nominating Lincoln as a quiet leader. The movie reinforced two perceptions about Lincoln that I held after this earlier citation. Lincoln was comfortable with silence. He didn’t need to fill every second with conversation. Lincoln was a consummate story-teller and frequently use a good yarn whenever the situation called for insight, inspiration, or leadership. I left the movie still comfortable with Lincoln’s nomination to my Quiet Leadership Hall of Fame. I was intrigued by storytelling this past week. The idea started when I had conversations with two people who could captivate you with their storytelling. The first was a colleague who seemed to be able to talk about family and background as a story with rich context but soft words. Those soft words weaved stories about parents, horses, childhood experiences, and even children's teachers. I was intrigued by the impact of those soft words. The second was a semi-retired (her words) professor who talked about life experiences in a manner that seemed so distant from the Tweet/text message driven social communication that occurs today. I could have listened for hours to stories about education and family. She used very rich words and assembled those words into very captivating stories. Both instances represented styles that seemed so different from the sound bite bursts that deluge us every day. You will want to spend a few minutes reviewing this manifesto to add this valuable insight to story telling. Use a narrative style appropriate for business. I would recommend going to Schawbel's blog to gain additional insight to the list. At the end of the week, the conversations and the reading had me thinking about my storytelling capabilities. I hope you are inspired similarly. I recognize that different leadership styles are required for different situations. No one style is adequate for different people, groups or situations. On the golf course, you pull a different club from your golf bag depending on your lie and distance needed, an effective leader should have a set of leadership styles in his leadership bag to most effectively lead in different situations. A recent review of some work by author Daniel Goleman validated my thinking. Daniel Goleman is best known for his books on Emotional Intelligence. His best selling work defined a set of skills and competencies that defines how people manage feelings, interact, and communicate on their way to success. In his book Leadership: The Power of Emotional Intelligence, Goleman cites the leadership research of the consulting firm Hay/McBer that identified six distinct styles employed by leaders. The best leaders do no rely on a single leadership style but use multiple styles and are able to move between them seamlessly and in different measure depending on the situation and people. He conveniently summarizes the six leadership styles and their application in a chart that I have reconstructed below. You can access Goleman’s full description of the styles in the book, on in the original Harvard Business Review article Leadership that Get Results. Please remember that you can access HBR articles from your local library’s online database. My takeaway from the article is that just like I have clubs in my golf bag that I avoid because I need more practice, there are leadership styles that require honing on my part to become the Phil Mickelson of the Leadership Tour. Are you able to move and adjust your style as needed?